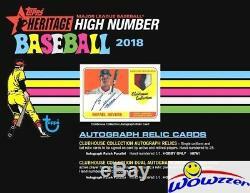 2018 Topps Heritage High Number Baseball Factory Sealed 12 Box HOBBY CASE! We are Proud to offer this 2017 Topps MLB Baseball Heritage High Number Factory Sealed 12 Box HOBBY CASE! This Factory Sealed HOBBY Case includes TWELVE(12) Factory Sealed HOBBY Boxes! Each Factory Sealed HOBBY Box includes 24 Packs with 9 Cards per Pack for a Total of 216 Cards per Box! EACH Factory Sealed Box includes One Autograph or Relic Card! 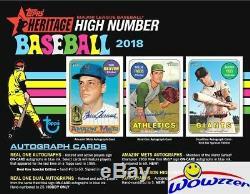 The Regular Issue 2018 Topps Heritage Almost TRIPLED in Value earlier this year and This High Number Release has much lower production! 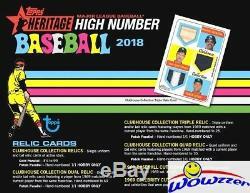 2018 TOPPS HERITAGE HIGH NUMBER BASEBALL CARDS BOX HITS. 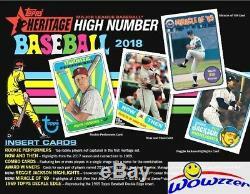 2018 TOPPS HERITAGE HIGH NUMBER BASEBALL CARDS PRODUCT HIGHLIGHTS. Retired and active players sign. Select cards will feature players that appeared for the last time on a Topps card in 1969. Signed in red ink, hand-numbered to 69. Retired and active players, from the same franchise, sign. In blue ink, hand-numbered to 25. World Series Champion 1969 New York Mets sign. In blue ink, #'d to 69. In blue ink, #'d to 5. Featuring deceased players from the 1969 set, #'d 1-of-1. Featuring musicians and celebrities that were popular or relevant in 1969, #'d 1-of-1. Heritage High Number Autograph Relics. Single uniform and bat relic cards to be. By active and retired players, hand-numbered to 25. Retired and active players, from the same franchise, featuring a relic piece and. Autograph Patch Parallel #'d. Heritage High Number Relic Cards. Single uniform and bat relics of active stars with a. Dual uniform and/or bat relics featuring a player from 1969 matched with a current player from the same franchise, hand-numbered to 69. Triple uniform and/or bat relics featuring a player from 1969 matched with a current player from the same franchise, hand-numbered to 25. Quad uniform and/or bat relics featuring a player from 1969 matched with a current player from the same franchise, hand-numbered to 10. 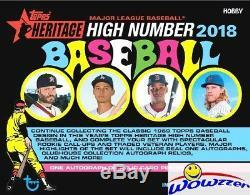 Heritage High Number Insert Sets. Top rookie players not captured in the first Heritage set. Highlights from the 2017 season and connections to 1969. Featuring two or more players in a single image with a name for the combination. Cards for each pair of players named. 2017 MVP, Cy Young, Rookie of the Year, Manager of the Year, All-Star MVP, World Series MVP. 1969 Topps Baseball Deckle Edge insert. Showcasing highlights of an MLB career that began in 1969. 1969 New York Mets postseason run. Heritage High Number Box Loaders. 1969 Topps Bazooka Ad Panel. 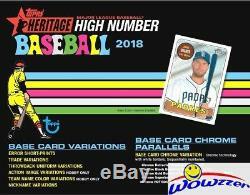 Heritage High Number Base Set, Parallels, Variations. Base Set - 225 cards. That are essential to complete the set. Regular Variations: Error SPs, Traded, Throwback Uniform, Nickname. Variations - Action Image, Team Name Color Swap. HOBBY & VALUE BOXES ONLY! Get business information that counts! - Vendio Counters are active content free. 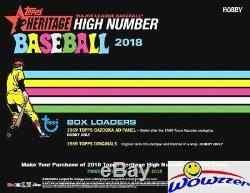 The item "2018 Topps Heritage High Number Baseball Factory Sealed 12 Box HOBBY CASE" is in sale since Friday, June 15, 2018. This item is in the category "Sports Mem, Cards & Fan Shop\Sports Trading Cards\Baseball Cards".